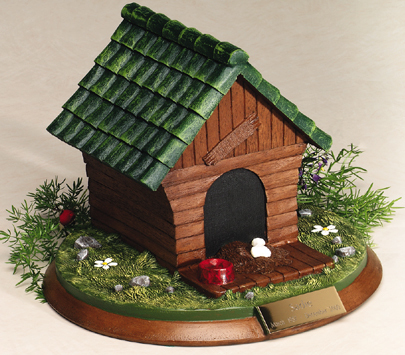 Cast from polymer materials and then hand painted, this urn is available in three sizes. 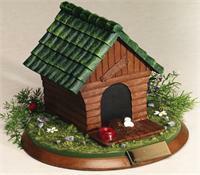 Realistic details include wood grain on the house and base, a bone, dish, lush grass and flowers. A 1x3 area is available for optional engraved plate (purchased seperately) which can be seen below. Closure: Bottom Stopper seals with adhesive. 12.875" Dia. x 8.75"H 100 cu. in. Urn Weight: 11.5 lbs.